You are here > Home>Case Studies>New Tuffa Fuel Lines for Trueline! 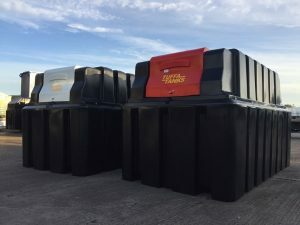 Trueline Midlands Ltd has recently taken delivery of two Tuffa 2,500 litre horizontal bunded fuel stations for their new base in Leicestershire. Trueline is a family run landscaping and ground works business based in the village of Wartnaby near Melton Mowbray. They specialise in a diverse range of ground works including fencing, landscaping, timber builds, excavation and forestry services for commercial and domestic customers throughout the Midlands. They also offer a unique ecological service and provide end to end project management from design through to completion of the finished scheme. 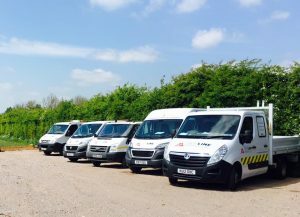 As the business has grown, their vehicle fleet has increased in size, now comprising of 12 vans, 7 excavators and various support vehicles. Trueline Managing Director, Tom Macfarlane, told us more. 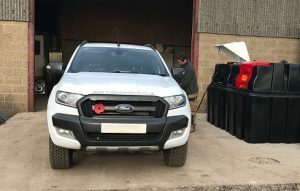 Tom decided to increase the capacity of his on-site red diesel storage and add a similar white diesel fuel station to fuel the vans as they left the Wartnaby HQ. Tuffa produced two horizontal bunded fuel stations with red and white colour coded flip lids for easy identification. Now all Trueline’s vehicles are fuelled on-site and the business has streamlined its fuel management. Tom Macfarlane again: “It’s a far more efficient system for us. Our drivers are no longer spending valuable time looking for a forecourt on the way to a job and the administration of our fuel purchasing and management has been simplified to the diesel supply to our premises,” he said. The Tuffa bunded fuel stations provide a clean, safe and secure storage and dispensing system. The diesel tanks are bunded, with the fuel stored in an inner tank which sits within an outer bund. The bund is a minimum of 110% of the capacity of the inner tank, helping to prevent overfilling and spillage, complying with all legal requirements for Secondary Containment. The tanks incorporate a secure, lockable hinged lid, 2” fill connection with cap and chain, a float level gauge and digital flowmeter. They have a fast 60 litre per minute submersible pump with a generous 4m of delivery hose and automatic shut-off nozzle and holster, just like a garage forecourt diesel pump. To find out more about Trueline and their ground works services, please call 0800 030 66 65 or visit www.truelinemidlands.co.uk. You can find full details of our range of diesel tanks here. Please call our friendly sales team on 01889 567700 for all price enquiries and technical specification.